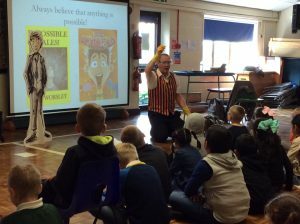 My first away trip of the new academic year was to East Lancashire for two Danger Zone assemblies in Burnley at St John Southworth and St James’ Lanehead. First stop was St John Sothworth. It had been a couple of years since my last visit so I had plenty to tell the children. The pupils got to see all of the Danger Zone manuscripts from the first draft through to the final version. There were lots of gasps and shocked expressions! Martin provided drafts of his illustrations for the children to see and they even got to see how he creates the front cover ‘Eric’. He really is a talented fella and I’m lucky to have him on Team Eric. 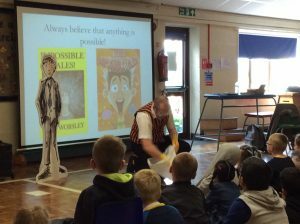 I couldn’t visit without putting on the storytelling waistcoat to share an Impossible Tale. I shared ‘Pat On The Head’, which is a particularly stomach-churning story. After grabbing lunch, I headed to St James’ Lanehead for my fourth visit since my writing adventure started. The school invited parents and carers as part of ‘Family Friday’, so it was great to share Danger Zone with the adults and the KS2 pupils. 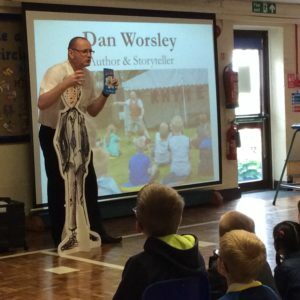 I shared the new book then put on the waistcoat to tell ‘Keep Your Hair On’. This is a story I haven’t performed many times, but it went down really well. Two great visits with over 300 fantastic pupils. Thanks Miss Stuttard and Miss Stott for organising the visits at their respective schools. I had an top time!